There will be an audience for this documentary who will love what it sets out to do. This film, which was directed by Kelly Cox and shot by Lucas Longacre, follows the stories of a number of young girls around the world who have particular 'big dreams'. Statistics tell us that only 1 out of 20 companies are led by women CEOs. 9/10 participation in technology is centred around men. Women lag behind in computer sciences and technology and the film sets out to give us varied and empowering examples of how not only should this not be so, but that a lot more can be done to encourage girls and women to enter these areas with confidence and professionalism. They are introduced to us one by one at the beginning of the film and we learn a little bit about their background and how they have come to have this dream. Cassidy is the all-loving all-dancing American student, who is studying computer science, has made an app and is heavily promoting an International Women's Hackathon. She worked hard to get participation for her Hackathon, but was somewhat disappointed on the actual day of the conference. She went out to drum support at the big science and technology fair she was attending asking participants are there any hackers here who would like to join the Hackathon. Tellingly, she did not get many to come forward. Hacking may mean more to those in the business but to your average person, it has a bad connotation. I was surprised that she didn't take the trouble to explain what she was looking for and how women or young girls could participate. It was almost naive but perhaps that is the privilege of youth. Another youthful aspirant from Nairobi wants to set up her own developer school as she was not able to attend the one in the US due to immigration reasons. 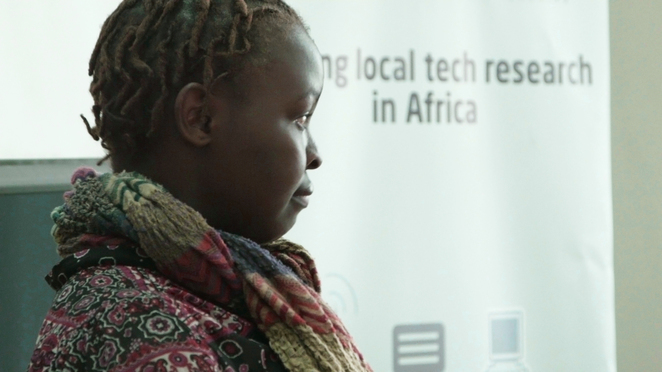 She felt that so far Africa had been a user of technology but not a creator and she wants to set young girls on the course of learning and innovating in technology and to win the Nobel Prize by the time she is 30. We wish her the best in her efforts. Kassandra from Phoenix Arizona is an ambitious young girl who has a multitude of technological interests, but high on her list is becoming a 4 star Admiral in the US Navy. Not the kind of career that her family thought was possible or even likely for her, but her mother soon realised that it was important to support her in that dream. Kassandra herself is very determined and knows that one of the reasons she is attracted to this career is because there are aspects of the military, which are appealing to her. She recognises that she has to fight her own battles and she hates being pitied or the feeling of pity. Does she achieve this? You will have to watch the film to see where she ends up and why. Marwa and Asya live in a very different corner of the globe - in the State of Oman, which has a relatively open and tolerant leader who encourages learning and innovation. The girls have used technology to develop an online programme of assessment and information for dyslexic children and their parents. Theirs is a different life - middle class and fairly privileged, but one lived within the confines of their culture which they are trying to open up, to enable more young girls to feel equally empowered. Ashana comes from a disadvantaged background. None of her family, adoptive or biological, finished school and her determination to get a college education is at once admirable and remarkable. She is constantly looking at ways to better herself and her internship with Black Girls Code will be a summer of exploration and learning, because as she eloquently puts it, people look at you and say "You are black, you are a girl and you are in computer sciences - this is a almost unheard of" - and she wants to make it commonplace. Mariana from Costa Rica is focused on leaving her mum and her culture behind and pursuing a career at NASA and the school of engineering. She sets off to start her course with high hopes but loses no opportunity to talk to her old school about her dream and how pupils there must pursue theirs. All these young women have aspirations and big dreams and they share a common drive to conquer technology and computer sciences, long held to be only " inhabited" by boys and young men. These girls have no constraints about their backgrounds, their gender, their financial status, their cultural norms or the expectations that they set out to fulfil. In fact, to the contrary, these are strangely unifying factors which allow each and every one to go further in the direction they need to go to complete the reality of their dream. The stories were interesting and well filmed. Something that I also appreciated is that the filmmakers did not shy away from telling us where the young people went wrong, where they failed in their attempts, and how some of them had to change their vision slightly. I think the film could have been edited more closely to concentrate the messages and the outcomes, but it is a heartening example of young women breaking down barriers and pursuing their dreams in ways which, perhaps some years ago, would not have been possible.